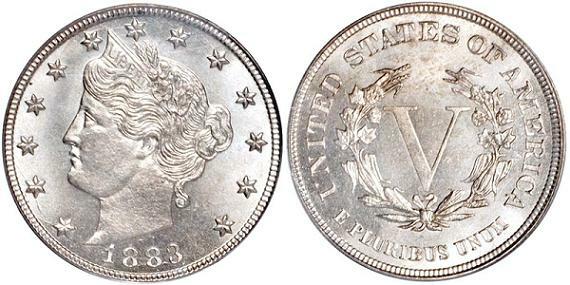 Liberty Nickels were officially minted between 1883 and 1912. They were made of 75% copper and 25% nickel. They featured a bust if "Liberty" on the front and the Roman Numeral "V" on the reverse. So, although they are commonly known as Liberty Head Nickels, they are also sometimes referred to as V Nickels. The first coins minted in 1883 did not include the word "cents" on the back and were very similar in size to the five dollar gold coin. This was quickly noticed by con artists who took advantage of the fact and coated the nickel with gold to make a quick profit. Legend has it that a character by the name of Josh Tatum, a deaf mute, was caught trying to pass one of these gold-plated nickels off as a five dollar gold coin. This is supposedly where the slang term "joshing" originated. 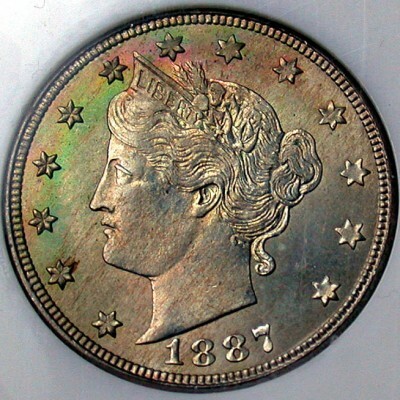 This legend has never been proven, however, the mint did add the word "cents" to the coin in the middle of 1883. There is another interesting bit of history for liberty head nickels. It seems that an employee of the mint made five unofficial liberty head nickels in 1913 and snuck them out of the mint. These five coins, as you can imagine, are very rare and valuable pieces today. Liberty Head Nickel - Variety 1 Without "CENTS"
Liberty Head Nickel - Variety 2 with "CENTS"
For some great deals on U.S. Liberty Head Nickels and Coin Supplies visit my friends at Jake's Marketplace, Inc. They have a very comprehensive selection to choose from and give great discounts! Learn about Rare Nickels and error coins you should watch for.